This was my attempt at using Botnik’s predictive keyboard Voicebox to write an intro to this piece through the “Jerry Seinfeld standup” setting. Best known for their viral projects such as the machine-written Harry Potter chapter “Harry Potter and the Portrait of What Looked Like a Pile of Ash” and an off-the-wall AI-generated Scrubs monologue read by actor Zach Braff, Botnik has become known for feeding text into their machine-learning technology for ludicrously humorous results. Since its inception, Botnik Studios has produced hilariously farcical video game names (Mario’s Face Is Missing 2), dating tips (Watch a yoga class with a big bucket of salsa to share), and motivational posters (Dance like a winner hates you!). Co-creator Jamie Brew and Chief Scientist Elle O’Brien gave us some key insight on their fascinatingly zany projects, discussed Botnik Studios’ upcoming album, and even used the technology to generate an interview answer. Jamie Brew: I first started doing predictive text experiments in 2015 while I was a writer and editor at Clickhole in Chicago. That led me to a whole world of other people who were doing creative tech, especially on Twitter. Botnik as an official legal company started in 2016 when Bob [Mankoff] and I signed some papers, and Botnik as a full-time job started last year when I moved out here to Seattle for an incubator program with Amazon and Techstars. Right at the start of that program, I met Elle, who had been doing a bunch of cool neural net generation and somehow happened to live in Seattle. In the year since, the community around Botnik has been a growing snowball of creative people interested in creative machines. Elle O’Brien: Jamie and Bob [Mankoff] got in touch over their mutual interest in bringing computers to the comedy game. They’re both accomplished in their respective domains (Bob at The New Yorker and Jamie at The Onion and Clickhole). I was a mildly disgruntled PhD student experimenting with neural networks (a statistical learning method that can model text), mostly teaching them to do tricks like generate motivational quotes and romance novel titles. I blogged about it and Jamie thought it was relevant to Botnik and found my contact info through a mutual Facebook friend. It turned out we were living about a mile away from one another. That’s how I got started with Jamie and Bob. Mike [Frederickson], our creative director, was a friend of Jamie’s from Brown, where they both studied cognitive science. It can’t possibly be a coincidence that all four of us studied neuroscience or psychology at some point (I have a master’s in neuroscience and Bob knows more about the psychology of humor than anyone else I know). I balance my Chief Scientist duties (working on the language model) with my PhD program, studying the neuroscience of language. Jamie Brew: Usually, it starts with an idea for a source text or combination of source texts that a writer thinks will produce interesting results. There’s not much method to that part – it’s an intuitive decision. After that, you use the predictive keyboard — either on your own or alongside other writers — to churn out a bunch of lines for whatever you’re writing, whether it’s a new song or a new book chapter. From there on, the process feels very much like a writers room, moving lines around, figuring out where there are gaps to fill with a new predictive line, getting a sense of the flow of the piece, and shaping it into something that feels good. So, overall, the typical Botnik project is a sandwich: an intuitive, human-generated premise, a chaotic machine brainstorm, then human curation and assembly. Elle O’Brien: The creative project ideas are overflowing at Botnik Studios. Anywhere I see text, I imagine what it would look like through a Botnik lens. I think that happens to all of us. My favorite ideas come when I’m rolling my eyes, thinking, “Oh, this again.” This trope in a song, this particular way of writing about beer, this reliably inoffensive but unhelpful voice you encounter so much in customer service. The more familiar a voice is, the more fun it is to put it through Voicebox. For our tech, I have a practical view: what kind of tools would get everyday people creating and laughing together? My dream is to make Voicebox so easy, accessible, and well-integrated with other channels of communication that my family will use it. We’re spread out all over the country, but I want to compose a letter to my dad written as Martha Stewart, and then maybe he’ll answer me as Thomas Jefferson, and my brother will give us Shakira’s input. Maybe we’ll write a new breakfast food recipe together using our predictive recipe keyboards and someone will try it and tell us how it turned out. I want to make tech that keeps people creative and connected to the people that matter. That’s always in my mind. Jamie Brew: It would be great to collaborate with a horse breeder to create names for horses. 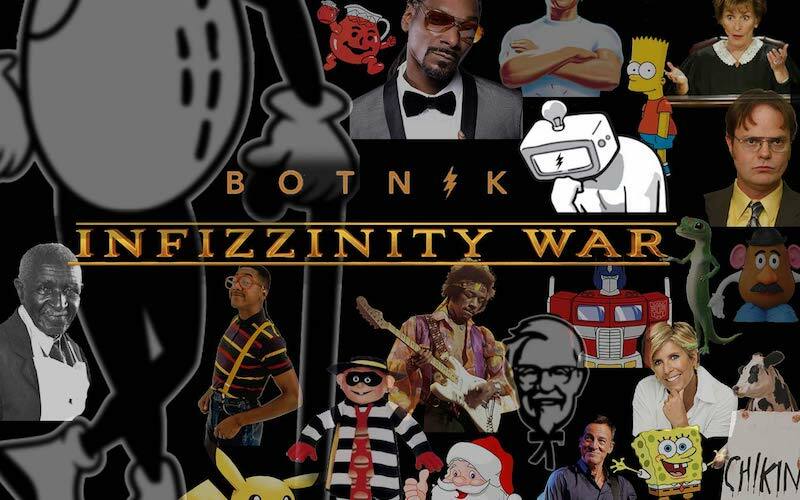 Elle O’Brien: We wrote a Botnik mashup of the Marvel Cinematic Universe with a couple other beloved franchises, called “Infizzinity Wars.” I’d love to work with any of the actors from the Avengers films on bringing this to life. Josh Brolin, if you are interested in playing Mr. Peanut, please contact us. Jamie Brew: It’s going to be the only album you will want or need to listen to again. Elle O’Brien: That is pretty much it. Should your favorite artist decide they’re hanging up their guitar, no worries: we can generate endless more songs they only wish they’d written. Jamie Brew: I really liked our neural net Coachella poster and its hundreds of unmissable bands. Elle O’Briend: I’m not even a football fan, but my favorite just might be when we used Voicebox to write new Bill Belichick post-game commentary. Thanks for all your help. Thanks for letting me go to the gym. Thanks for letting me use your phone to call the police on my way to the gym. Thanks. Elle O’Brien: In the cosmic calendar, we are indebted to the stars and planets for this great doughnut. – Carl Sagan. Next article Is Tom Brady a Cheater?